At All Around Moving & Storage, we specialize in providing our customers with professional moving services at great prices. Our team of dedicated movers is available on your schedule to relocate your home or business, but we also offer everything from moving supplies to warehousing and storage. We’ve been in business since 1984, and since then, we’ve put together a comprehensive list of moving services based on our experience with our customers. When you choose a moving services provider, you want more than just someone to pack and transport your items – you want a team of experts on your side who can provide you with relocation solutions for any concern that may come along. That’s why All Around Moving & Storage offers a wide array of moving services, whether your business wants to take advantage of cross-docking to get your items where they need to be faster, we have you covered. We offer these services because we believe that our customers and their belongings deserve a full-service moving experience. Our complimentary moving services are available for most moves, and we always do our best to accommodate any needs our customers might have. If you have any special requests that need to be addressed before, during, or after your move, feel free to get in touch with All Around Moving & Storage to discuss them. 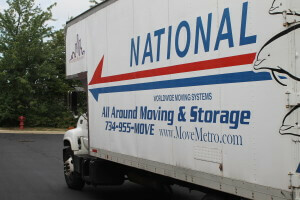 Our movers are always happy to help, and we guarantee your complete satisfaction throughout the entire moving process. To learn more about our professional residential and commercial moving services, contact All Around Moving & Storage at 734-941-2280.